It’s about that time of year when we all get together for the last hurrah of the summer season, the good old Australia Day BBQ. Of course, that also comes with the essential lamb. In Cypriot feasts, we generally get out the Souvla to cook our lamb and halloumi, but we appreciate that is not in everyone’s backyard. What’s the next best thing? 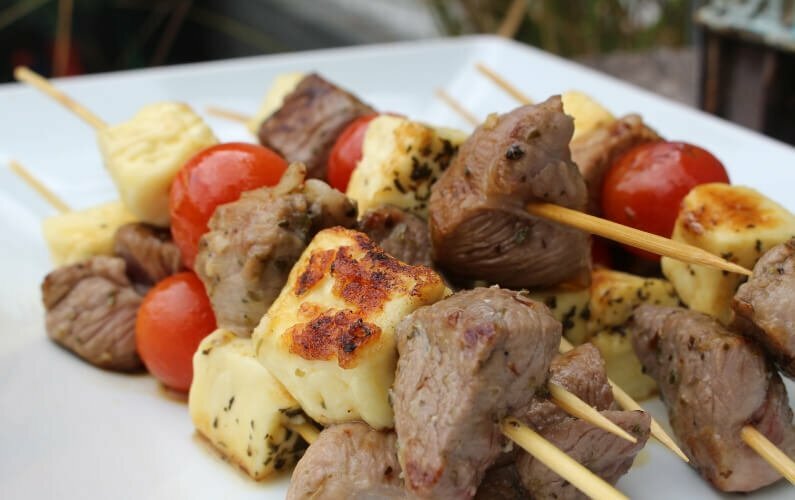 Delicious marinated skewers of lamb threaded between delicately soft squishy cubes of Olympus halloumi. These lamb and halloumi skewers are very easy to prepare, and a little lamb goes a long way. Choose a good quality lamb as it will make all the difference to the flavour and tenderness of the meat. Don’t leave out the delightful burst of sweetness from ripe cherry tomatoes.These tasty skewers will be right at home alongside your prawns and pavlova for a fun and tasty multicultural Aussie treat. Cut lamb and halloumi into evenly sized cubes. More uniformed sizing will help ensure even cooking. Combine garlic, oregano, mint, oil, lemon juice and paprika in a dish. Add lamb pieces to the dish, and marinate for approximately 2 hours, or overnight if prefer. Once your lamb is nicely marinated, it's time to create your skewers. Thread lamb, halloumi and a cherry tomato onto skewers to your taste. When ready to BBQ, simply grill on a medium heat until nicely browned (approximately 6 minutes). These skewers are lovely just as they are, or if you prefer, whip up a delicious tzatziki and serve inside warmed flatbreads with your choice of salad. If you love this recipe, you might also love our vegetarian version - Barbecued Olympus Halloumi Kebabs. Our products are made using non-animal rennet, so they are suitable for vegetarians. Why not do both for your BBQ? Find out how to buy Olympus Cheese.